A new study suggests that current ‘hotspots’ of shark activity are at risk of overfishing, and that the introduction of catch quotas might be necessary to protect oceanic sharks. Tens of millions of ocean-dwelling sharks are caught by fishing each year, and catch rates have declined significantly for many species, yet oceanic shark fishing remains largely unregulated. A lack of data on where sharks are likely to encounter fishing vessels hampers current conservation efforts. The research, published in Proceedings of the National Academy of Sciences of the U.S.A., found significant geographic overlap between hotspots of oceanic shark distribution and fishing activity. 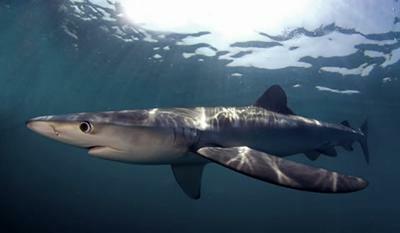 “Many studies have tracked sharks, and many studies have tracked fishing vessels, but fine-scale tracking of sharks and fishing vessels together is lacking, even though this should better inform how shark fisheries should be regulated,” says Professor David Sims of the University of Southampton, UK, the senior author of the study. An international team of researchers from the UK, Portugal, Spain and U.S.A. tracked more than 100 sharks from six different species by satellite across the entire North Atlantic, one of the most heavily exploited oceans. Concurrent with the shark tracking, the scientists tracked 186 Spanish and Portuguese longline fishing vessels using GPS to quantify the overlap in space and time. Blue shark on commercial longline. Marine Biological Association. From the sharks’ satellite tracks and from remote sensing images of the ocean environment, the team found that within each species’ preferred range, sharks tended to aggregate in locations characterised by strong temperature gradients and high productivity. 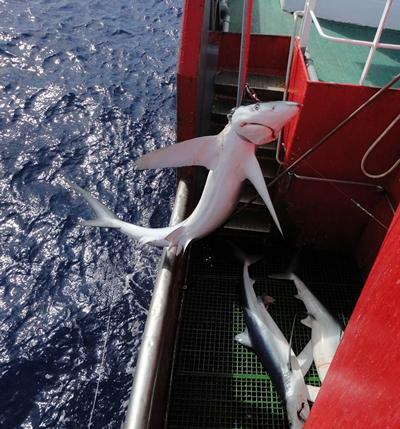 Perhaps unsurprisingly, they found that the fishing vessels and sharks targeted similar locations. However, the scale of the overlap was surprising. For the most heavily fished shark species, blue and mako, about 80 per cent of the sharks’ tracked range overlapped with the fishing vessels’ range, with some individual sharks remaining near to longlines for over 60 per cent of the time they were tracked. “Although we suspected overlap might be high, we had no idea it would be this high. Space-use overlap on this scale potentially increases shark susceptibility to fishing exploitation, which has unknown consequences for populations,” says Dr Nuno Queiroz of the University of Porto, Portugal, a lead author of the study. The researchers propose that because current hotspots of shark activity are at particularly high risk of overfishing, the introduction of catch quotas or size limits will be necessary to protect oceanic sharks that are commercially important to fleets worldwide at the present time. Areas of highest overlap included the Gulf Stream, the North Atlantic Current/Labrador Current Convergence Zone near Newfoundland, and along the Mid-Atlantic Ridge southwest of the Azores. Over the period 2005-2009, the overlap between sharks and fishing vessels persisted between years in hotspot locations. “This highlights how broadly the fishing exploitation efficiently ‘tracks’ oceanic sharks within their hotspots year-round. In the North Atlantic, it seems threatened sharks have few places left to hide in the face of industrialised, high-seas fishing of the last 50 years,” says Professor Sims.